So I decided to add them on TSR with 4 new variants: glass, 2colors gradient, 3 colors gradient and version without long eyelashes on the bottom. Here I will write about slider version. If your sim have so different eyes with Eyelids and Eyeform sliders you can download version with sliders. What's differency? Differency is in renumbered meshes and created for this renumbered mesh custom GEOM-based sliders and in number of polycounts. Slider version of eyelashes have 11k polycounts, TSR version without sliders adopted for low poly and not so good computers and have 3,2k polycounts. Created sliders are only for LOD0(Very high). 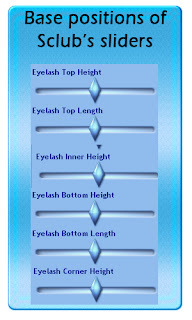 First of all I need to say that slider version eyelashes conflict with Eyeball Awt's sliders and mesh, so if you have this mod you can not use my slider version because you eye will be deformed because they(Awt's Eyeball mesh and my renumbered eyelashes) have the same numbers of IDs in mesh. 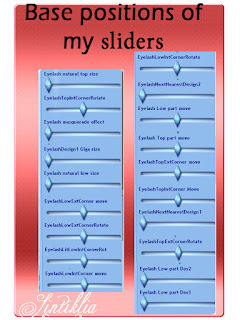 If you want to use slider version of eyelashes so much, you need to delete eyeball's mod from game for a time of using slider version eyelashes in game. If you have S-club's eyelashes with all sliders, you need to put their sliders into base position, because their sliders a bit deform a part of my eyelashes. 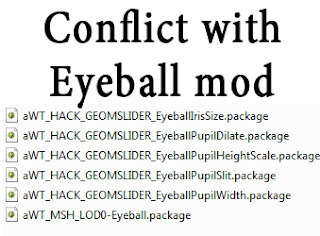 If you don't have theses problems and your sims have normal eyes( just test no slider version and you will understand if you need slider version or not)( not so different and modified with eyelid and Eyeform sliders) you can download version without sliders and conflicts with all mods. 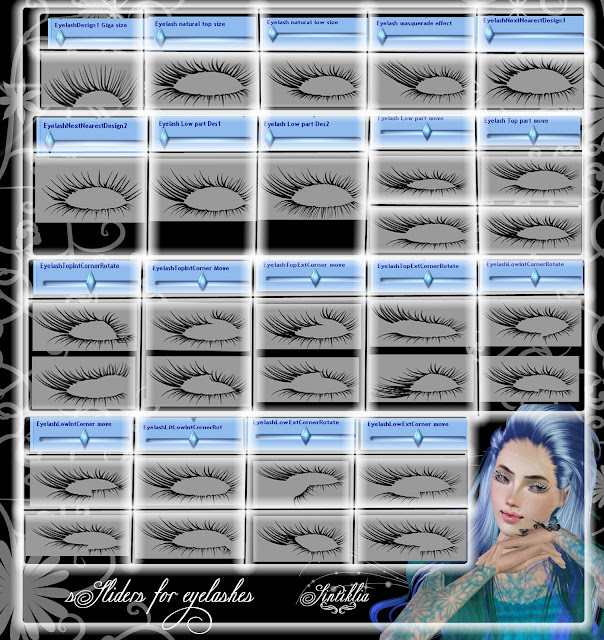 Remember Eyelashes Slider version have 11k polycounts in Very High lod, 5k polycounts in High lod and , if you have slow computer, 1k polycounts in Low lod,don't overload your computer so much and download TSR no slider version! Do not reupload my work to any fileshare or site!Post new only with link to my site!